Of all the metrics I’ve been wondering about following my Weight Gain Experiment, CIMT certainly ranks in the Top Three. I speculated several times that I wouldn’t be surprised if it had an impact. But how much? First thing’s first — I always knew and have stated several times publically that this last experiment could have short and long-term risks, which is why I’ve been very vocal that I don’t want anyone else to do it. That said, I was doubtful four weeks of SAD was going to do something dramatically bad — or at least, that whatever it did I could undo given time and discipline. Obviously, I take comfort in having observed the downward trend I had from July ’16 to Nov ’17 in the hopes I’ll recover that drop again. But given just what we have to look at here, the precipitous drop took a year and a half. Could just four weeks of SAD and corresponding weight gain have brought it up so quickly? One thing is for sure, this data should be very powerful for anyone who likes to “take a break” from their keto diet for the holidays. Six Months or Four Weeks? It is true I’m inclined to assume it was the four weeks of the SAD diet that impacted my CIMT the most. Much of the reason for this assumption comes from the fact I had done a number of carb-swap and carb-addition experiments both in the May ’17-November ’17 cycle as well as the November ’17-May ’18 cycle. The one obvious difference between the two being the Weight Gain Experiment and my getting this CIMT right near the end of it. Nevertheless, it would’ve been better to have gotten the CIMT right before the experiment started in April to confirm this. But to be sure, I didn’t imagine we’d see such a substantial impact! Science! 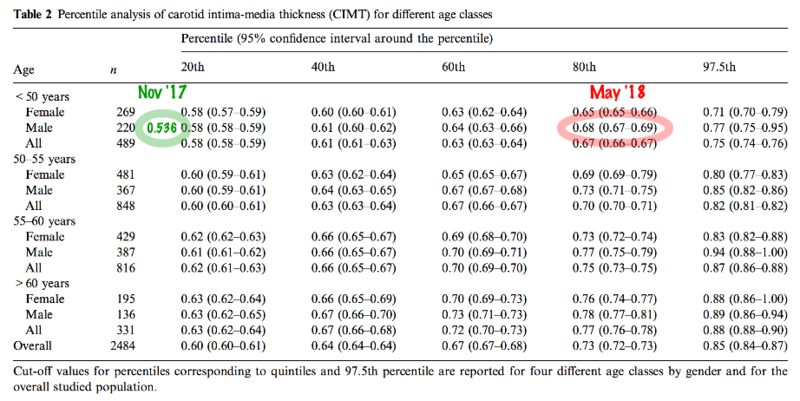 I got a little curious about age-stratified CIMT scores and did some browsing around the interwebs. What follows below are some grabs along with my circling of the November ’17 score and the May ’18 score in contrast. It seems no matter how you slice it, this was a move from clearly a low-risk category to clearly a high-risk category! But here’s the kicker… as you can see from the chart above, I originally was in a high-risk category early on into keto, but I precipitously dropped into the low-risk category while following the diet. Richochet. Can I drop it again as I go back into full keto? Only time will tell. Dave, thank you for doing this work. It is admirable that you are putting your own skin in the game, knowing that you are putting yourself at risk, to openly provide this data for anyone interested. Remarkable results for four weeks of the Standard American Diet. As mentioned above, I know I’m assuming a risk — I just don’t know how much. Obviously, I assume it isn’t substantial in the long run, but I likewise acknowledge no one really can say for sure. As experiments go, this one definitely demonstrated the most surprising results and I’m happy to have captured so much of the data (which I’ll be open-sourcing soon). But I doubt anything will have surprised me like this CIMT change has. It’s quite jaw-dropping. Like I’m sure all my readers, I’ll be very interested in how the next few CIMTs look after being fully keto for a while. It’d be interesting to see if you could replicate that. That is, do whatever you were doing to drop it, the data would show it dropping, then do whatever you did to get it to go up, and see if it does go up. How much error is there in this test? Need to know if chart axis is in mm’s? It’s in nanometers (nm), which is 1000 per micrometer (mm). Dave, just so you know, micrometers (um (really greek mu-m)) are not the same as milimeters (mm). I am assuming you know that, but since the science police occasionally visit, I thought I should make the point! I’m curious if you think a similar result would obtain with a CAC test. I did a quick check and found an abstract stating that CAC and CIMT correlate well. I’ve heard opinion that CAC is something of a “gold standard” in terms of CVD predictive value. (And I’ve scheduled a CAC for myself). Thanks for all the work you’re doing. I’ve passed it on to siblings in an effort to educate them. I’m not sure of that correlation. I have a + CIMT, but a CAC of 1. Wish both of these were part of the standards of care so the data set would be much richer. OTOH, bigPharma, bigMed, bigFood might not like what is found. I’m curious about this too. I opted for the CAC as I read in Dr. William Davis’ book, Track Your Plaque, that the the CIMT was not as accurate. As I understand it, the radiation from the CAC is also too high to have done more than about once every 10 years. I just had mine done in March and had total score of 8.83 with left main at 0, LAD at 0, RCA at 0, and LCX at 8.83. Unfortunately, this was my first, so I have no idea if the past 6.5 years of LCHF has improved anything. I also don’t know if it is even possible to improve. The best I can hope for is no worsening. I’m curious to know what the margin of error is on a test like this (ie how precise is it in terms of measurement). Would two tests back to back show similar numbers? That’s definitely my question. CMIT is highly dependent on operator technique. Three or four tests in a row might expose this issue, although I’m sure there is a known accepted margin of error. Dave, I feel like the rate at which you are uncovering interesting things is incredibly fast compared to medical researchers, which is great. But there are problems – for example, it is not even widely accepted that changes in CIMT are clinically significant. Apparently many doctors view it more or less as a static value, which seems pretty odd to me, but what do I know. So when are you going to get your Silicon Valley friends together to fund a series of massive clinical trials? i do not believe the correlation between CIMT and health of coronary arteries all that strong; and may make sense as some have strokes but not heart attacks and vice versa. Do you layout the SAD diet u followed somewhere? Thanks. Good grief! No wonder they are so reluctant to use this test, or CAC or that matter. Here in the UK an increasing number of patients can no longer even have trigs tested, or reported. Just total “cholesterol” and a ratio. Keep them on the carbs and statins . . . I live in UK – trigs is very easy to get. If you want more then PLAC test is £70. If you want VAP test it is about £300 which includes homocysteine. CRP is free as is vitamin D.
Depends on circumstances and where you live. Here our nurses can only do the cut down test, it needs a doctor to do the full monty. LDL actually used to be measured rather than calculated until they changed labs which was interesting, it came out about halfway between the Friedwald and Iranian calcs. GP could not authorise CRP or homocysteine, it took a consultant. Yet I can get not only TSH but T4 AND T3 (hyperthyroid), in many places only TSH is available. Getting actual numerical results can also be a problem, nurses don’t give them out, only doctors or as I discovered recently the receptionist will print them out. Frankly I’m no longer concerned about my lipids, once I went low carb/Paleo/keto thirteen years ago, my HDL doubled and trigs fell to about 10% of what they were (I guess I must have killed my insulin resistance!) LDL remains a bit high but not enough to be called hyperresponding, and have all been quite consistent EXCEPT when my thyroid is high the LDL drops like a stone, and goes back up when it is overtreated and goes hypo. Pretty sure I would need a consultant to order CIMT or CAC. Maybe a funeral director . . .
Amazing Dave, congratulations, I had not expected this would be so rapid. 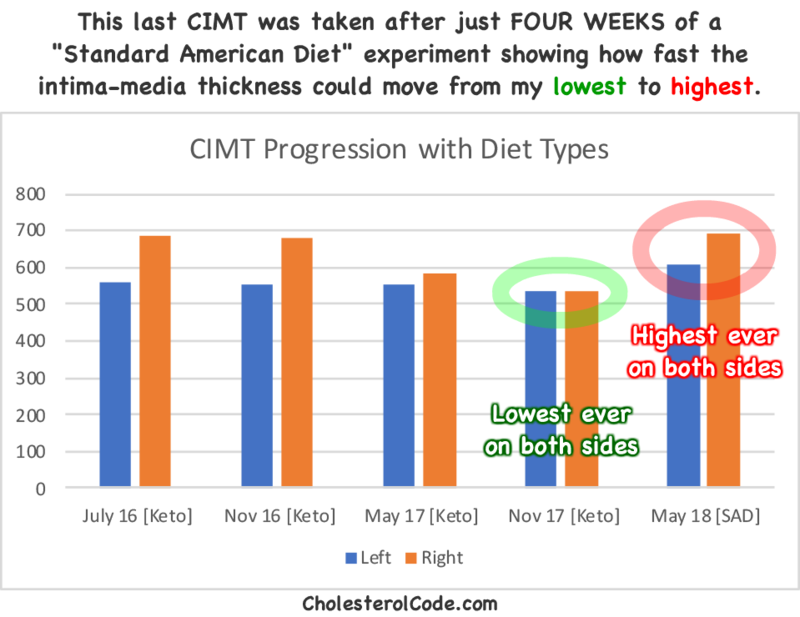 Proving that keto can lower CIMT and hence CAC/calcification and hence risk of heart disease/myocardial infarction is a really big deal. Great experiment (hope no irreversible effects come fromt it) – quick question: originally you had stated that you had a goal of going up to 205-210 lbs – did you get there? I’m keen to know if, after fat-adaptation, the energy metabolism CICO mechanism is affected (either by increasing output / energy expenditure or via fat storage as would be “expected”). Best of luck getting back to square one (keto wagon). I am trying to improve my CIMT score, and I have a hard time without metrics to track my progress. Your frequent testing and manipulation gives me hope that CIMT could be sensitive enough to try every few months. Do you have a clue what is the minimal interval for a significant result? Also, I wish I had some daily measurement to take that might correlate with CIMT, vascular health, or inflammation in general. Do you have any idea for something I could track to see how my lifestyle is effecting my goals? Thank you very much for pioneering this quest. After about 18 months on low carb high meat and eggs diet I did CIMT test and now I’m a bit puzzled on how to interpret it. My ICA/CCA ratio is 0.901 and 0.892 right / left side respectively. Internet says <2.0 is normal https://radiopaedia.org/articles/ultrasound-assessment-of-carotid-arterial-atherosclerotic-disease, but according to Dave's references, 97.5% of men below 50 (I'm 40) have less than 0.77, so my results are very bad. Unfortunately, I don't have results before going low carb, so it's hard to tell if my atherosclerosis is from 39 years of LFHC and almost no red meat diet with excellent cholesterol markers (total cholesterol always below 180, LDL below 120, trigs between 60 and 70, low CRP), or from 1.5 years of HFLC and high cholesterol (last test was 275 total cholesterol, 203 LDL, 2004 LDL-P, 48 trigs). I'll re-do the test in 6 months or a year, hopefully it won't be much worse. Another interesting observation, my cholesterol levels are going up steadily after going low carb and doesn't react to changes in fat and carb I'm eating. I tried full keto with a lot of saturated fat, cholesterol jumped from the baseline in a few months. Then tried to stay in keto but switch to avocados, olive oil, macadamia nuts and fish, cholesterol was steadily climbing still. Then experimented with high meat and various amounts of carb (20-150g a day) without being in ketosis and doing tests every few months, cholesterol climbed still to current levels. At about the same time I switched to low carb I started lifting weights and did way less cardio stuff compared to the years before that. Weightlifting supposedly should lower LDL, so I wonder how high it would be if I wasn't lifting at all. On a positive side, I feel way better and stronger eating meat, my old traumas and joint / back pain almost went away. I wonder how much it's from the change in diet and how much from weightlifting I never did before. I just realized that I didn’t get artery intima-media thickness number at all and mixed up ICA/CCA ratio with the numbers I was looking for. After talking to the doc who did my test and listening for 15 minutes that I don’t need those numbers I paid for, he agreed to redo the test. From what I heard on the phone my numbers shouldn’t be bad. It’s the second time I did CIMT test and didn’t get what I paid for, even after specifically asking what I need, in the results there were just vague words and no numbers. I’ll be back in an area in about a month and hopefully I’ll get a proper test this time. I wonder is it a common thing not to get intima-media thickness number without asking for it very very much? Oh I see… I had the same issue with mine – if yours did what mine did they likely did a carotid Doppler instead which uses the same equipment but doesn’t give a number (they’re just visually checking for plaque). If this is the second time you’ve had an issue it may be worth asking the office for a recommendation of where you can get one done that does it routinely (like a nearby hospital). It doesn’t look like you mentioned it here, but what is your HDL? If it’s high, it looks like you might be a Lean Mass Hyper-responder. If in your position, I’d likely do the same – consider the first CIMT a baseline and double check it in 6 months or so. If you haven’t already it may also be worth getting a CAC (Also called a cardiac CT w/o contrast) to check for calcified plaque. That typically takes a while to develop, and it’s one of the things I consider worth getting early on as another baseline. By the way, were you losing weight as your cholesterol trended up? As people lose weight on a low carb high fat/ketogenic diet I typically see cholesterol (total and LDL) trending up as they get closer and closer to being lean (sometimes there’s an initial drop, but it seems to frequently end up at this pattern).